I’ve been dipping into the book ‘Craftivism’ recently, it’s by Betsy Greer, but has contributions from many other crafters and artists. One contributor, Inga Hamilton, begins by explaining her love of craft, but continues to tell a story of working with her husband on an exhibition called Elementals Birds. She describes it more as a social experiment, coming from a negative feeling experienced whilst at another exhibition. It wasn’t revulsion at the exhibits, but rather a mix of dark lighting, art in dark charcoal and graphite, and discordant music, that were purposely brought together to create a disharmonious feeling within the soul. Inga questioned, if an artist focusing on the negative can bring such an experience to the viewer, could it work in the opposite way? A meditative discipline was developed for creative people to practice before beginning work. then invited 100 creators to follow it. They were asked to create a variety of birds from a choice of templates given to them and asked to focus on positive and loving thoughts. These thoughts, brought from the heart, down the arms, and into the piece they were creating were focused on the viewer, wishing them unconditional peace and goodwill. Of the 100 asked to participate Inga saw four different responses. Single, male artists, who couldn’t take part, not because they didn’t want to, but because they couldn’t wish peace and harmony to complete strangers; they didn’t know how. Mainly graphic artists and painters, who were happy to take on the challenge and asked for the bird templates. Almost all replies past the deadline, came from craftspeople. Their responses were late because they had been consumed by the project itself. Few of the craftspeople wanted the templates, creating off-piste, sculpting, carving, building birds that sang, birds that raised money for the homeless. birds that focused on mental health. The result was the most successful exhibit to date staged at the venue. What if I followed a similar technique as a tool for bible study. What if I read a portion of the Bible, then sat down and created something. Could God use my art and whole being to create something that otherwise would not have been created? Make your space – get out some drawing or craft tools, paper, pens, things you feel like working with and set them up as though you were about to make something. Decide whether to have music playing, I prefer music. Read the story or chapter you’ve chosen. Sit still for a moment. You might have come to the craft space with something in your mind to make, take the moment to clear that idea away. create – just create. Maybe you make nothing at all, maybe you make a mess. The ‘God-Art’ might not come for a moment or two, that’s ok, just continue making. Focus on God, What might he be saying? What did you read? Keep an eye on your natural tendency to pre-guess what is being made. Imagine God working through you, through your hands and into the paper or item. At some point in the process you might start to see the message. Don’t worry about your skill level, this is between you and God, and he thinks your talent is just perfect for what he needs. So, I had a go, and just to show you how it went I videoed the process. 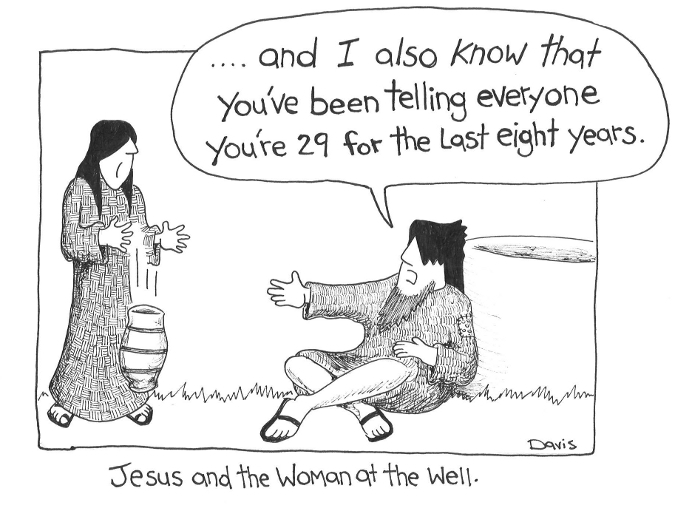 I chose the story of the woman at the well because it was used on Sunday at a church I went to. It is a long video (15mins) but there is no time limit to this. It you give it a go, share the creation with me, I’d love to see it.